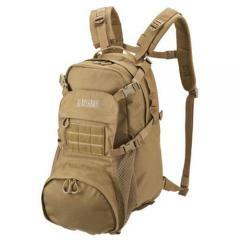 Blackhawk Cyane Stealth Pack FREE SHIPPING! Designed to offer maximum storage in a discreet package, the Cyane Stealth Pack from Blackhawk is the ideal day pack for tactical professionals, outdoor enthusiasts, doomsday preppers or anyone else needing to carry a lot of gear. A generous main compartment offers over 800 cubic inches of storage as well as a versatile slash pocket. A beavertail-style from compartment provides an additional 300 cubic inches of space to pack gear into, in addition to a secure carry option for oversized items such as helmets. Six adjustable compression straps help keep loose items secure and accessible as well as organized. Three external web platforms provide versatile attachment options for MOLLE and S.T.R.I.K.E.® compatible gear. Designed for all-day use, the tactical pack boasts a 100-oz hydration reservoir and three hose ports. ©2002-2019 CopsPlus.com: Blackhawk Cyane Stealth Pack FREE SHIPPING!